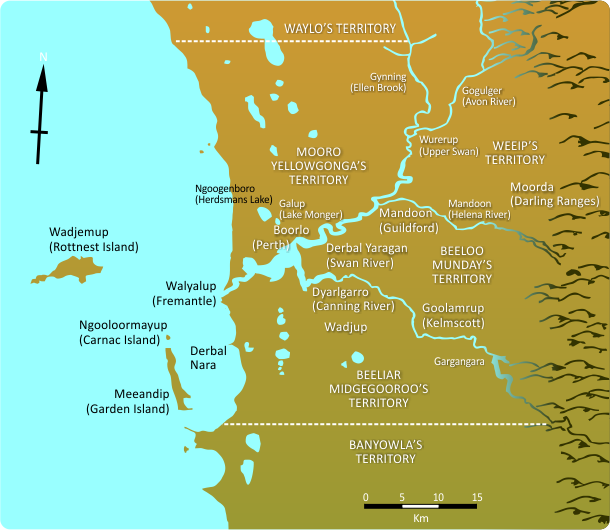 Derbal Nara is located in Beeliar, Midgegooroo’s territory. According to traditional owner Dorothy Winmar’s account, life in the area was very comfortable. ”…my Grandmother told me, the way she told it to me, it sounded like it was paradise. They didn’t want for anything. They lived off the land and the fish from the water. They got the kangaroo skins pegged out and cut them up to dry them and sewed them to make coats; yongka booka, or kangaroo coats, choota bags out of them, rugs to sit in. They were quite contented with their lives. 3. Green, N. Broken Spears: Aboriginals and Europeans of the southwest of Australia. Focus Education Services: Cottesloe, Western Australia. 1995, p. 50.